Hazy orange-yellow pour with a healthy cap of foamy white head that receded to a more manageable level, but never sank to less than a ringlet; moderate lacing on the glass. Aroma of musty citrus and earthy funk, somehow dirty and clean at the same time, cobwebs and wet grass. This was all reflected in the taste, musty, grassy, earthy, nice notes of lemon zest, 7Up, cobwebs and wet cardboard, with a perky acidity/sourness that was not too intense, and a slight bittering finish and earthy reprise. Complex and well-balanced, one of the better gueuzes I've had. Medium body, medium carbonation appropriate for the style, crisp, prickly mouthfeel. Great gueuze overall. Need more somehow. 750ml black foiled, caged and corked bottle. Not quite sure if this is actually discontinued - this was bottled Feb 17, 2011, and is apparently good for 10 years hence. I'm assuming the label notes were written by the Belgian half here, but I'm not so sure. This beer pours a quite hazy, dark apricot amber hue, with three or four fingers of climbing, puffy, thinly foamy off-white head, which leaves some rather thick fuzzy webbed lace around the glass as it very slowly abdicates. It smells of sour, tart, almost meat-like citrus (mostly lemon) rind, pith, and flesh, a dry cheesiness that I now see as culpable for the meatiness, dried-out late summer hay, a subtle dose of funky yeast, and a touch of stoney minerality. The taste is quite bitter and tart, without any direction or reason at first, before a hollowed-out cherry, lemon, and raspberry 'fruitiness' emerges, to deliver us from reason, into a subtle melange of softly astringent wooden barrel notes, the sharpest of northern Italian cheese, a tame yeasty funk, and some mild earthy, straw-like hops. The carbonation is frothy, and only slightly barbed, the body a somewhat surprising medium weight, and as smooth as the tiny effervescent bubbles will allow. It finishes still quite dry, the tartness of the emasculated fruit, yeast, and barrel woodiness not really entertaining any other nuances. The best Cantillon-esque experience I've had since, well, my last iteration of (central) Brussels's finest sour ales. Tart, fruity, yeasty, and sure, ethereally malty, all under a tightly-reined umbrella of due balance, the niceties of which are better left to better investigators than I. Well worthy of the hefty price tag, to try something that may never again arise in nature. I had this in my fridge since a short time after the sour and bitter fest where it was acquired and sent to me by a very generous trader. Poured from a 750ml into a matching 3F geuze tumbler. The brew appears a hazy golden cooper color with some green looking tint around the edges. An effervescent amount of carbonation rushes the surface and produces 3+ fingers of fluffy white head. It leaves some patches of lace sticking to the wall of the glass. The smell includes a solid bouquet of citrus and rindy elements mixed with earth and a hint of something along the lines of moist cork. A tropical aspect runs throughout with more focus on fruity rinds, zest and pulp somewhat like lemon and orange. 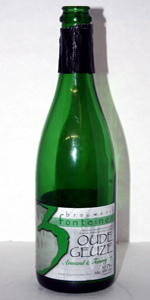 This is a bright smelling geuze with subtle hints of funky earthen character. The taste is more earthy than the aroma would lead you to believe. A solid rind to pulp flavor of lemon and oranges is present just like the aroma suggested. Mid palate is a flavor of earth, cork, and a mild hint of wet cardboard. This brew has a percieved bitterness of rindy fruit thatbis bright and citrusy leanin toward lemon. Overall a solid blend of flavors that is quite approachable without the acidity being too intense. This is a medium bodied brew with a modest to effervescent amount of lively carbonation that is uplifting and tingly to the palate. A solid amount of complexity with a bit more perceived botterness than one might expect. Very drinkable with seemingly no alcohol impact. I dont know what the story is with this beer. Perhaps it just wasnt a widely talked about brew or was lost behind the magic re-release of framboos? I cant believe more people arnt talking about this, its fantastic and id love to have more. Bottle at Chicago Burbs Thursday Mega Tasting. A - Pours a hazy golden yellow color, white head, spotty lace. S - Lots of funk, must, hay, barnyard, citrus sweetness, oak. The tart notes are really nice and there's a light acidity as well. The blend is really spot-on...yum. T - Funky citrus sweetness, oak, hay, must, and barnyard. The citrus and funk work perfectly together, and everything is just so smoothed out. Finish is tart citrus and funk. M - Light body, good carbonation, dry tart finish. O - An excellent blend and this really tastes like a 3F Oude Gueuze Vintage from 2002 or 2003. Just superb. I want more of these immediately...in fact, I demand it! Get this now! Side note: We had this after Loerik, which was a mistake, because it wasn't nearly that good. However, this is an really excellent Gueuze and I would suggest stocking up. 750ml bottle, ordered (very luckily) by my tasting group from Etregourmet. Poured into a 3F wine-style glass alongside all four Armand'4s as part of a ridiculous Lambic tasting. A: Mainly clear medium-amber body under a thick, glass-filling tower of off-white foam. Great retention and lace, especially for the style. S: Interesting balance of classic 3F funk - earthiness, minerality, cheesiness - with heavy ripe fruitiness. Plum, apricot, and orange, as well as some bell pepper. Excellent. T: Sharply acidic, with huge lemony sourness up front. Grape skin and earthy funk behind. Clean, sour, medium-dry finish. Really great, but very different from the nose. M: Lively, spritzy-at-first-creamy-thereafter, medium body. Perfect. O: Yet another beautiful Geuze from my favorite Lambic producer. While I wasn't quite as blown away by it as I was by all four seasons, it certainly held its own in the line-up. The aroma in particular contained some distinctive fruity notes that came as a surprise. It's well-worth trying if you get the chance, but unless you're an obsessive completist (yes, I'm guilty as charged) you'd be better served going after something like 3F Oude Geuze Vintage or any of the Armand'4s. 750ml corked and caged bottle into a Cantillon tulip. Shared with schen9303. Cork ejects with a loud, crisp pop. Beer pours a massive, as expected 3.5 finger foamy white cream head with great retention. Beer is a clear copper. Lacing is stringy and thick with good stick. Couldn't ask for more here. Nose is citrus, lemon, hay and sharp cheesy tartness. Nice, crisp and aromatic. Opens sharp citrussy tartness. Lemon peel, hay, sharp cheese and a funky tartness at the middle. Some cobwebs and more hay at the end with dashes of wet and rotting wood here and there. Finishes with a filmy lemon zest tart/bitterness. Same in the aftertaste. Definitely above average but the funkiness is a bit underwhelming here and its pretty simple overall. Light bodied with ample carbonation. Prickly and lively in the mouth and goes down accented, bubbly and slightly oily. Messy finish with a long, lingering aftertaste. Real drinkable. Good for the style. A very solid beer overall. Like a well aged Oude Gueuze. However, this is nothing to write home about though I'm more than happy to age a few bottles to see what happens with time. Pour is dark amber with strong haze, lots of tight bubbly off white head. Nose is huge, so funky, tons of Cobb web and dusty notes with a bit of mineral and some juicy tangerine in the back. Taste isn't quite as funky but still quite so. Dusty funk, lots of cob web, notes of mushroom. Light mineral notes with the juicy tangerine through the finish with a light sourness, strong carbonation and a moderately dry finish. Another offering from these guys and i love Port brewing too,it pours a golden orange hue with a huge fluffy four finger head and sudsy clingy lacing everywhere,the smell is green apples,white grapes,vineger,a touch of caramel and a slight mustiness,the mouthfeel is just under medium bodied and tart with tastes of white grape vinegar,granny smith apples,herbal hops,a touch of funk with the finish being sour,dry and tart,overall its nice but still abit young and be even nicer with some age on it cheers. Thanks Ryan for sharing this major "want". Split between 4 people. Peachy hued, pours somewhat hazy with a very good effervescent head and good retention as well. Signature 3F aroma with a dominant peppery note (compared to Oude Gueuze and Golden Blend anyway). Very sour and very lactic with tons of warehouse funk. Bursting with carbonation... always fruity somewhat floral at times. Only thing I can say against it is that it lacks the drinkability/approachability of the Oude Gueuze. Glad to have had it and thanks again!